Some time ago Matthew Florez of TRIPLABS posted an invitation to visit some Mp3.com sites featuring various projects that he's involved with. Matthew explains that TRIPLABS is a recording service, but also the "virtual record label" that the four bands below fall under. There have been some CD's released though TRIPLABS, though currently they have no distribution. Remember that Mp3.com sites offer music that you can stream on demand or download for listening at your leisure. These bands are each quite a bit different from one another, but all fall firmly into the styles that we love to cover at Aural Innovations and I'd encourage readers to follow the links we've provided to hear TRIPLABS' music at Mp3.com. Dr. Rajah Von Zeetar and The Electric Dream Conspiracy is a trio of Dr. Rajah von Zeetar on sitar, keyboards, and percussion, Mark Schoenrock (Pascal Fortran) on guitar, drums, and percussion, and Matthew Florez (Matt Zero) on guitar and percussion. There are 4 tunes available on their Mp3.com page, two being trippy psychedelic tunes and the other two being more song-oriented. There are a couple of long tracks on which the trio really stretch out. "Burning Flame" is an instrumental that took me completely by surprise. It's total liquid psychedelia of the most paisley sort. Eastern ragas and sitars float before your eyes as the world begins to slowly transform and you can't believe how many colors there are and how really beautiful everything seems and.... Whoaaah!!!! Listen to me... this stuff is hypnotizing! "Plastic People" is a mucho trippy acoustic psychedelic song. It has vocals but is structured less as a song than a drifting journey down a valium paced path. Good stuff, but "Burning Flame" is the one you should all RUN to Mp3.com to check out. The other real standout tune is "Millenium Master". A song about Y2K and an uncertain future, this is a dead ringer for an old Neil Innes song. It's got a great John Lennon sound but the melody is classic Innes. A simple but fantastic song. And "Cyber Lover" is a folky psychedelic Lou Reed styled tune. These guys can really write songs. Check them out at: http://artists.mp3s.com/artists/64/dr_rajah_von_zeetar_.html. The Electric Dream Conspiracy is the duo of Mark Schoenrock and Matthew Florez from Dr. Rajah Von Zeetar. There are only 2 very short songs here so it's hard to get a sense of what it's about. But "Shadows" is a raw jamming acid rock instrumental that I wished would have taken a while longer to stretch out. And "Melody" is a progressive rock instrumental that strikes me as a bit like Styx circa Grand Illusion, but with a bit of an Anthony Phillips Private Parts & Pieces acoustic feel as well. Hear the songs at: http://artists.mp3s.com/artists/64/the_electric_dream_conspir.html. Relativity Machine dates back to 1992 and consists of Mark Schoenrock and Matthew Florez from Dr. Rajah von Zeetar and The Electric Dream Conspiracy. 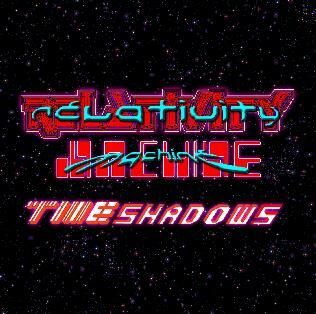 There are 4 Relativity Machine albums so far, with Timeshadows available through Mp3.com. The duo describe their music as avant garde psychedelic space music, and indeed these two serve up heaping portions of psychedelia with their space. Lots of long tracks here, with "Ages Of Earth" being a 20 minute space excursion that opens with rumbling drones, windy atmospheric synths, and a trippy flute melody to add the psychedelic to the space. The drones maintain their slow but powerful pace, the atmospherics gradually constructing their landscapes and textures. Strange freaky noises are peppered sporadically throughout to provide interesting bumps in the road, and what sounds like guitar creates some great bubbling space effects. I really like the added effect the flute provides, like a cosmic pied piper guiding the force that's creating the spacescapes. "Element 92" and "Le Reve De L'eau" are both lengthy ambient psychedelic voyages. Nothing special, but thoroughly enjoyable Sunday drives through a distant galaxy. "Epic" is held down by a basic thudding bass pattern that sets a steady tempo and helps to create the dark apocolyptic atmosphere created by the synth melody. It reminds me of the soundtracks from more than a few sci fi flicks. Imagine a darker, less symphonic Vangelis. With "Ganesh", however, we're back into Dr. Rajah Von Zeetar territory. Trippy guitar and tabla ragas and oh so sweeeeeet melodies. And "Nighttime" is a short spacey progressive rock instrumental. A touch of Pink Floyd with some tasty guitar licks. Listen to Relativity Machine at: http://artists.mp3s.com/artists/60/relativity_machine.html. Big Stereo Void is a solo electronic project by Matthew Florez, influenced by Stockhausen and the like. Two tracks are available at the Mp3.com site, the main one being the 20 minute Brainforest, which must really be long because it's noted as just being an excerpt. In any event, these are electronic excursions that are more on the abstract side than the space music produced by Relativity Machine. Simple patterns come together to create mechanical workouts that exist in space and time, and focus on pure sound, rather than melody, atmosphere, or emotion. Interesting stuff. "Garden Of Nightmare" is a shorter, but much more impressive, piano excersize. Intense ivory bashing is accompanied by the sound of a cat presumably in heat. Beethoven on psychoactive drugs. VERY nice. Check it out at: http://artists.mp3s.com/info/223/big_stereo_void.html. So... quite a variety of music here and all produced by the same people. I'm always impressed with musician who act on their varied interests and tastes and the TRIPLABS folks have done that with intriguing results. So head on over to their Mp3.com pages and have a listen while you continue reading our new issue. Questions about any of these projects can be directed to Matthew Florez at: dnmflorez@earthlink.net.